This course I am doing, is passion driven learning so even though my task required only one innovation, I spent the week ‘lost in’ my computer finding out about much more than just my task. The learning point for me here is that the possibility of ‘bringing research up to date’ imbued the task with excitement. One that I do not remember experiencing when I was a researcher years ago. I remember writing a letter (and later framing the response, of course) to a researcher I admired and waiting weeks for a response. So how did I get on with my investigation? Was this project still running? Have any more papers been written about the project since the Seely Brown and Adler paper was published? Was the project adopted by users other than those in the original institution where it was developed? My initial stop was the library at my university, I am an academic after all and it seemed the ‘right’ place to start. I learnt about criteria for evaluating searches on the internet, something I already know something about but always helpful to be reminded not to go down any alley without evaluating if it is a blind one first! I was reminded of the hours spent in real life (RL) when I was a researcher searching at the university library. I was a whizz at finding stuff, but the process was never fun. This search was also productive but not fun. I found out that the space in Second Life (SL) called Terra Incognita (TI) was an ‘Action learning Center’. Watch this if you want a summary of action Learning and a treat: a learning presentation in SL given by Decka Mah who created TI for her Phd dissertation. 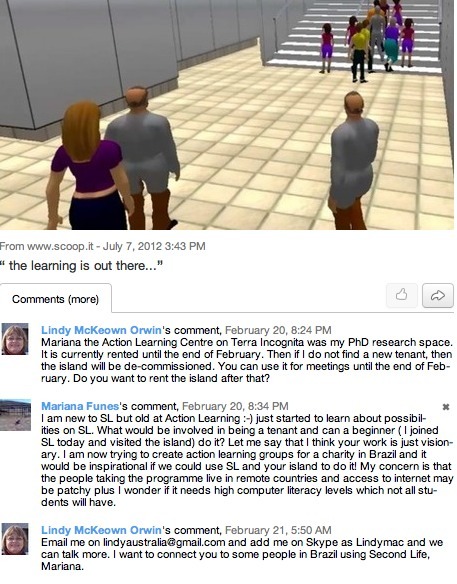 Now I was hooked as an action learning expert in RL, I just had to see how this model was set up in SL. Yes, I joined SL for the first time and headed straight for TI. Nothing much happened as nobody was around but I could check out the area, see the action learning model posted at the entrance and a table and chairs set up for an action learning meeting. I was new to SL and had no idea how to navigate myself there. I had to make a call: either I stay here and learn about the environment or I get back to my research. I had achieved the goal of my inquiry in my first visit: Yes, Terra Incognita was alive and well in SL. It was time to go and not to start playing with customising my avatar. I then started to address the other elements of my quest. I thought I would just do a standard google search to see what I could uncover. I recently discovered a search engine called a Millionshort which helps remove top sites from results – I thought this may give me paths less travelled. I learnt that the research programme was completed in 2007, that Lindy McKeown Orwin (RL) or Decka Mah (SL) had done her Phd on this. There is a Moodle site that just states the programme has ended. So far so good, and much more fun than searching a library catalogue, I have to say. What happened next did astound me but perhaps should not have. I found this and it had all I ever wanted to know about TI. The assignment that this blog attempts to answer has been set in just this way. We are meant to find and explore each others’ blogs to help each other learn. I just did not expect to have been helped so much so quickly by another student who had delivered her assignment earlier than me. I felt duty bound to take my Terra Incognita quest to the next level. In her blog Patricia says it had been difficult to find out if the ‘University of Southern Queensland is still using this virtual space for experiential learning activities’. I made it my task to find out and what followed astounded me even more than finding Patricia’s blog. I love Scoop it and have my own curated pages on there, I noticed that Lindy Mackewn Orwin has her own Scoop page and headed straight there. It occurred to me the best way to answer Patricia’s question was to ask Lindy! What’s the worse that could happen? Well, I got all the answers I needed and more. Click here to read Lindy’s responses on Scoop. I had come to the end of my quest, and now had the possibility to ‘rent’ my own Action Learning Centre in Second Life. No, coffee at the library cafe with a book or ten does not compare with purposeful tinkering in the virtual world. This is not just about the fun, which is extensive – but may be I am just a geek. It is about being able to genuinely be part of a worldwide network of peers contributing to the expansion of knowledge through live productive Inquiry. I will let you know in a future post if you can find sitting at my new home in Terra Incognita with my group of Brazilian students.